We are driving around Mallorca, an island that is part of the Balearic Islands of Spain. The roads here are considered to be one of the best driving roads in the world and I can't disagree. The winding and smooth asphalt on the hills runs along the coast, the roads get narrow too but the driving experience gets all the more exciting. 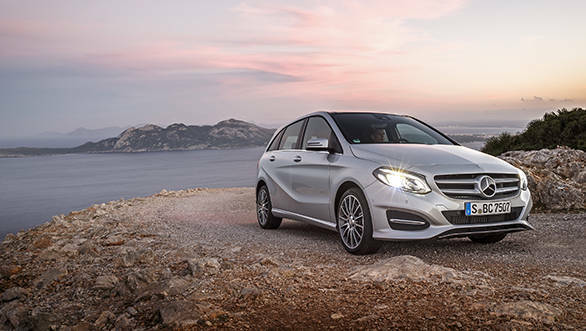 We aren't driving a fast sportscar here, but an MPV that is sporty and handles well too; it's the new and improved Mercedes-Benz B-Class. The B I'm driving produces 177PS and also features all-wheel drive, so I'm not complaining - these beautiful roads deserve to be driven on in a fast machine. This spec however will not make it to India. So why am I driving the most powerful B-Class diesel then? Well, the Indian spec isn't available here and all the other lower spec media cars also feature 4Matic as standard. So we decided to just go ahead with the top of the line variant. What's new, then? Well the cosmetic changes are, and these changes will also make it to the India spec B. The face receives the biggest change, everything you see in the front is all-new. Look at the B now and it does look a lot more like the new generation C-Class that will soon hit Indian roads. The reason for this family resemblance is the incorporation of a wider front grille and an entirely new headlamp. The latter follows the new design language - there are more sides to it now and it blends well with the new grille. The daytime LEDs are very similar to the outgoing model's parking lights and now move into the headlamp. The major change however is the use of LED for the main headlight as well like in other, more premium Mercedes cars. There will be two major exterior options available when the B goes on sale internationally - the regular trim and the sportier AMG Line - the latter looks arrestingly good thanks to a sharper design for the front bumper that is lower and features larger mock air dams. This trim will most likely not hit Indian shores. The regular trim, meanwhile, as seen in the pictures here, will be the choice for our market. The bumper in this variant is also all-new since it has to accommodate the new headlamp and grille. It does look quite elegant and the addition of chrome detailing adds some more class. The sides are very familiar since there aren't any changes. The alloy wheel design is however different - the ones seen here are larger 17-inch wheels that will most likely be offered in the petrol Sport trim while the diesel Style trim will feature smaller 16-inch wheels. Move to the rear and you won't make out the difference in the newer model unless it's parked next to the outgoing one. The bumper is slightly different in terms of design and houses the tailpipe trim. The taillamps now feature LED lighting. The interior also receives a few tweaks, the most noticeable changes being the steering wheel with a new design and centre infotainment display. The flat-bottom steering wheel was a delight to grip and looked like it belongs to an AMG car - we hope this wheel makes it to the Sport variant. 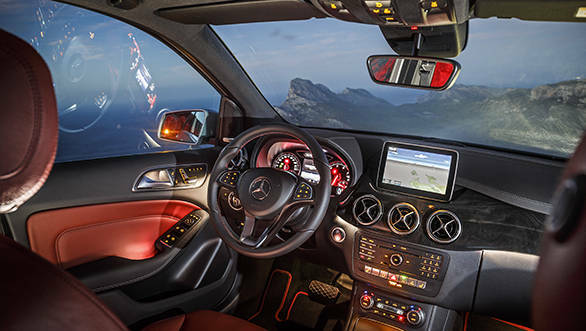 What will surely make it, however, is the regular full round steering that is a new design as seen in the latest generation C-Class - it even incorporates larger buttons for the controls, that are easier to use. The centre display is now slimmer and features a higher resolution screen. Two sizes are on offer, 7 and 8-inch, we hope the larger screen (which is also frameless) makes it to India. A newer gen Comand system debuts in the B-Class, a first for an MFA platform car and should soon be seen in the A and GLA-Class too. 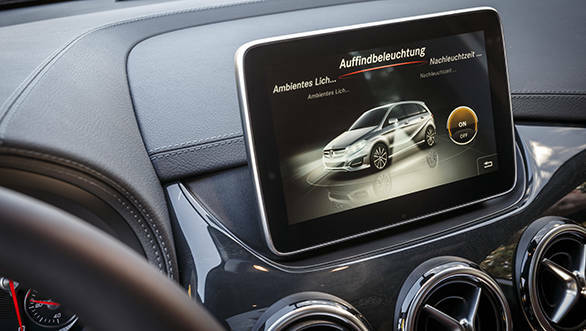 Next-gen telematics offer an easier to operate and better looking interface. Animated menus and various other changes, seen in the more premium new C-Class, have been given a miss. The system also connects online to offer various services (These may not be offered in India). Other changes include a revised instrument cluster, slightly different stereo layout and a dedicated start/stop button option. Cabin space is identical to the older model, so you still get a roomy and comfortable interior. The boot unlike the international model will continue to offer a removeable space saver that does take up space since there is no room under. Expect similar ride and handling too - the B we drove featured all-wheel drive and ran lower profile tyres with a suspension setting optimised for European roads. 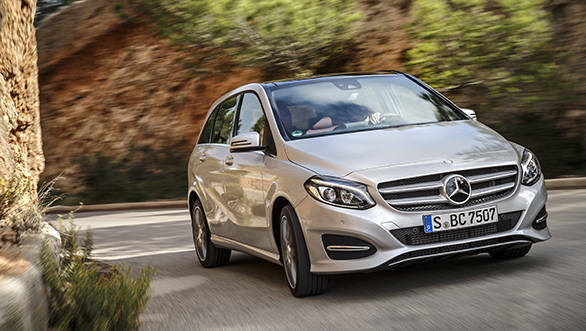 The India B -Class will feature the same softer suspension setup with increased ride height. The dynamics are impressive for a vehicle that is this tall. What about engine options? 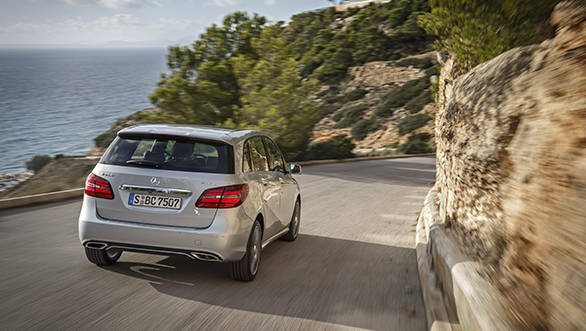 As far as we know, the same 2.1-litre turbocharged diesel and 1.6-litre turbo-petrol as seen in the current B-Class in India will be offered. Both these engines are offered with more power internationally. The engines offered in India right now are known to be not as powerful, especially when compared to the competition. 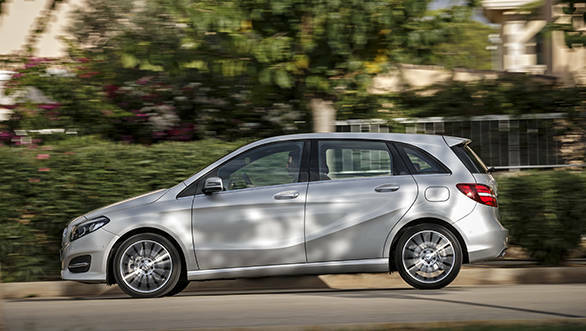 It will be nice to see Mercedes-Benz India introducing the more powerful versions here as well. 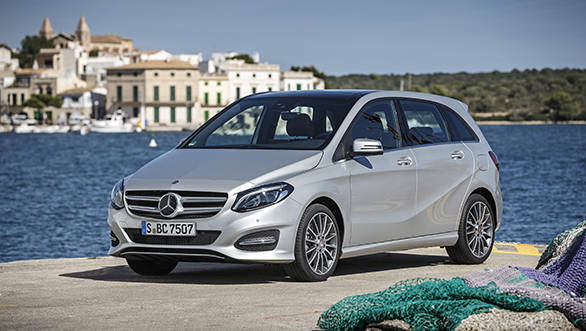 Overall, the B-Class is now a better looker, offers features seen in more premium Mercedes models and continues to impress in terms of space and comfort. The updated B will go on sale early next year and prices are expected to only go up slightly.